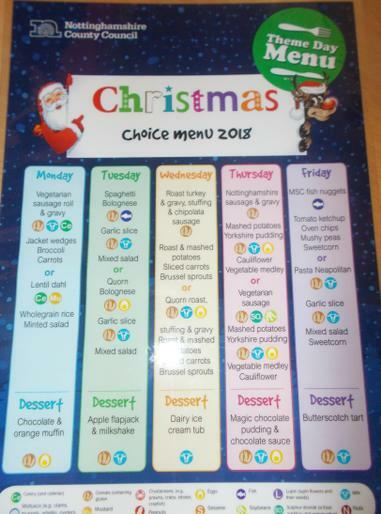 All Parents/Carers should have received a letter providing details of the schools Christmas Choice Menu 2018. This menu will run from Monday 10th December - Friday 14th December with Christmas Dinner being served on Wednesday 12th December 2018. All pupils who attend school all day can have a meal, please ensure you return the slip on the bottom of you letter if you would like a dinner ordering and specify if you would like a dinner all week or just on the Wednesday. All children in KS1 are entitled to Free school Meals, in KS2 you will need to apply for Free School Meals by contacting 0300 5008080 or if you are not entitled to Free School Meals the cost is £2.29 per meal (£11.45per week). If you have any questions please speak to the school office. A copy of the Christmas menu is attached.